Cuba has released two more political prisoners who had refused to go into exile in Spain under a deal brokered by the Roman Catholic Church last year. The two men - Hector Maseda and Angel Moya - were also demanding full pardons and the release of other prisoners who are ill. Both have now returned to their homes in Havana. They were among a group of 52 jailed dissidents Cuba's communist government agreed to free last July. Most of them were released within weeks, but 11 stayed in jail because they would not accept going into exile in Spain. But since last week, four including Mr Maseda and Mr Moya, have now been allowed to return home. Mr Maseda, 68, is a journalist and former nuclear engineer who founded the banned Liberal Democratic Party. He is the husband of Laura Pollan, the leader of the Ladies in White group that has been campaigning for the release of all political prisoners. Mr Moya, 46, is a construction worker, whose wife Berta Soler is also a prominent figure in the Ladies in White. The two men were among 75 people arrested in 2003 in a government crackdown on dissidents. Both were sentenced to 20 years in prison for crimes against the state. In July 2010 the government agreed to release 52 of the dissidents. All but seven have now been freed. The Cuban authorities generally refer to the detained dissidents as common criminals or mercenaries paid by Washington to destabilise the communist system. The release of political prisoners has been a key demand of the US and EU if economic ties are to be improved. 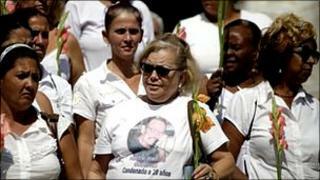 Opposition groups say there are still around 100 political prisoners in Cuban jails.